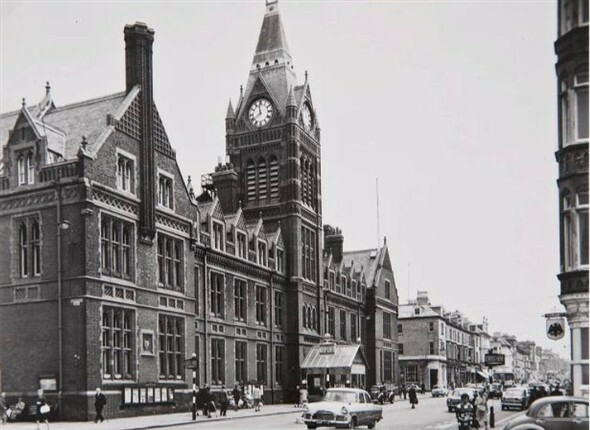 Hove Town Hall photographed just before the fire in 1966. I grew up in The Drive, one block over from the old Hove Town Hall and passed it every day. I remember attending jumble sales and flower shows there. I once bought some finches at a bird fanciers show; unfortunately the cat ate them. But the best was ‘All In Wrestling’ as it was called then. Regular wrestling programs were held at the Town Hall in the early sixties. Although I was too young to attend, the hand bills were free, and I collected a new one every week. My favourite, and the most regular performer, was the masked Doctor Death. What a dramatic night it was when my grandmother, who lived on the top floor, woke us up at 2am shouting ”The Town Hall’s on fire!”. As it was winter time and very cold, we watched the flames consume the top of the clock tower from the comfort of home. To this day, the smell of oak chips smoking on a barbeque reminds me of Hove Town Hall. One of my abiding memories is that the clock chimed so loud and on a regular fifteen min schedule that you always knew the time. It was a sad day when it was demolished to make way for the new building. Did you go to events at Hove Town Hall? Do you remember the wrestling? If you can share your memories with us, please leave a comment below.